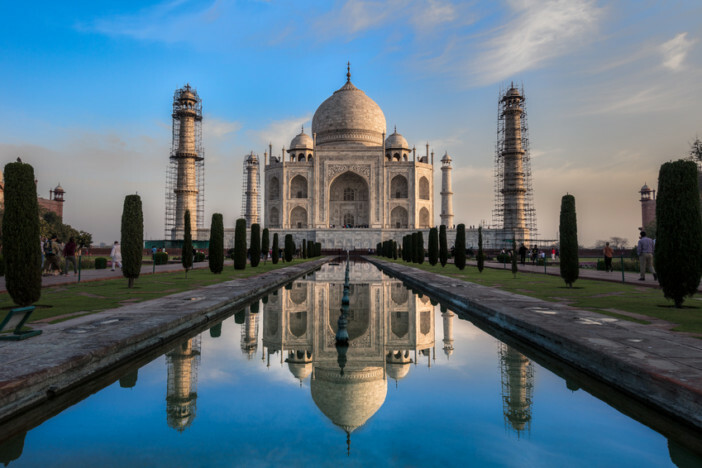 Possibly the most famous building in the world and arguably the most beautiful, the Taj Mahal is sure to be top of your to-do list when visiting India. Known for its famous ‘onion dome’, the Taj Mahal is an extensive complex of buildings and gardens that extends over a whopping 55.5 acres. It’s also home to the small town of ‘Taj Ganji’ to the south and a ‘moonlight garden’ to the north of the river. 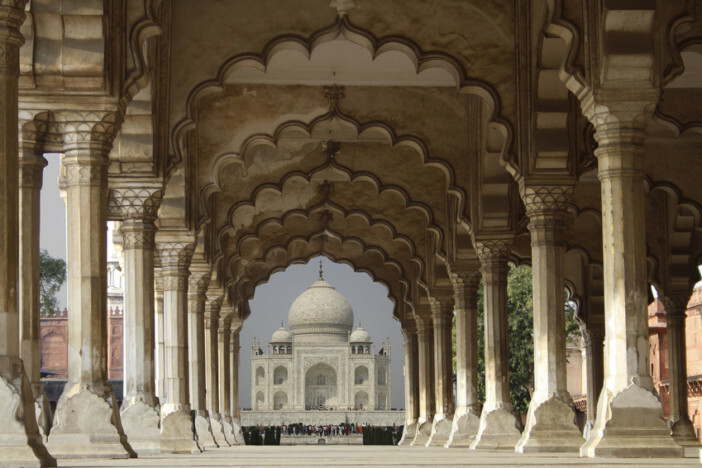 The awe-inspiring architecture is a great love story writ large – following the death of his beloved queen Mumtaz Mahal, emperor Shah Jahan employed the country’s finest architects and craftsmen to design the most beautiful mausoleum in the world to house her tomb. This sublime, love-inspired building is a vision in white marble and precious stones and if you’re heading there for the day, it’s best to be prepared. 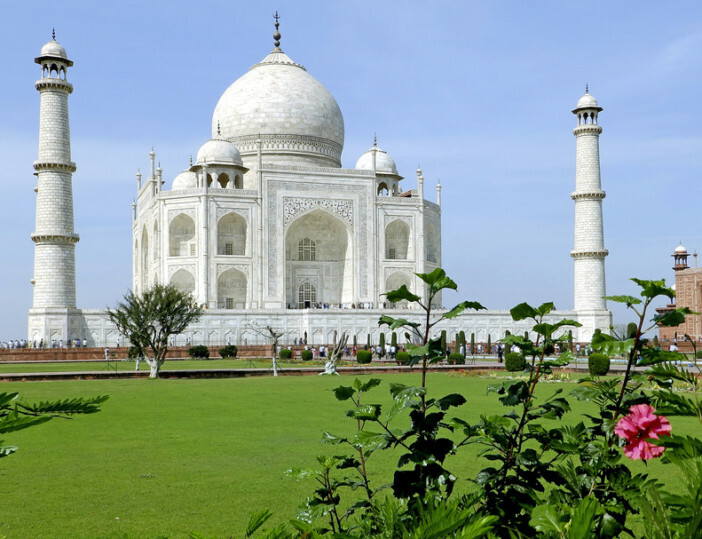 There are a few things to be aware of before you head to the Taj. Firstly, security is strict, very strict! The airport-style system is fairly chaotic and your experience could change from one day to the next but be aware that very little is actually allowed in. Leave backpacks back on the cruise ship and carry just one small bag with only the barest of essentials. You can bring one camera or mobile phone per person and, generally speaking, video cameras are not allowed (although you may be able to get one in for a small fee at the ticket desk). Banned items include anything edible (so boiled sweets are out) but also electrical goods such as headphones, phone chargers and iPads. Similarly pens of any kind, torches, knives and camera tripods are all out. Pack light to guarantee entry. To protect the Taj Mahal from pollution, cars and vehicles are not allowed within 500 metres of the complex so you’ll need to walk to one of the three entrances (East, South, West). The Western Gate receives 70-80% of all visitors so aim for one of the other two, the East Gate is easily accessible and quieter than its neighbours. When you arrive, you will find four lanes leading to security: foreign women, foreign men, local women and local men so don’t be surprised if you’re briefly separated from your other half. Get there early! It is best to arrive at the East or West Gate at 6.30am in winter – half an hour before it opens. (The South Gate doesn’t open until 8am). The Taj Mahal is open 7am to 7pm every day except Friday (when it’s closed for prayer). It is also open for moonlight viewing from 8.30pm. until 12.30am, two days before and after each full moon – definitely worth battling the crowds for. You simply can’t visit the Taj Mahal without taking plenty of pictures! The beauty of this iconic building is that the colour subtly changes hue throughout the day. From dusk ’til dawn, the sun illuminates the mausoleum, from pearly grey and pale pink at dawn, to dazzling white at midday and burnt amber at sunset. 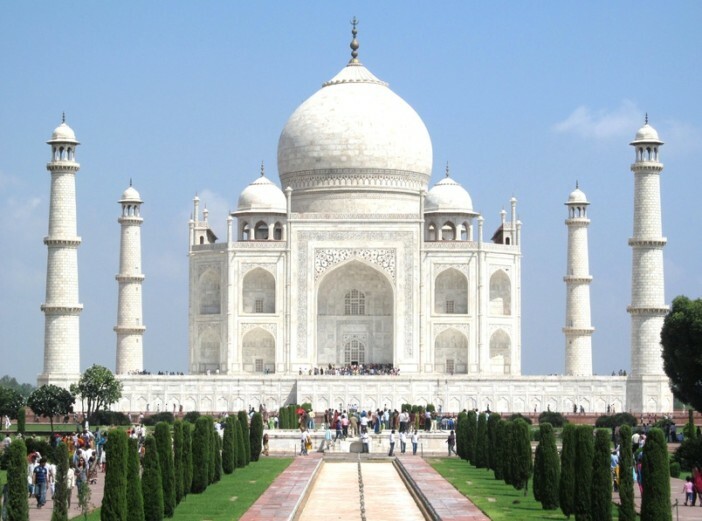 If you’re lucky enough to see the Taj Mahal at nighttime, you’ll see a translucent silver spectacle. You’re probably already familiar with the perfect spot to take photographs (where the late Princess Diana had THAT picture taken). The spot is centred directly in front of the Taj Mahal, with the blue pools stretching out behind. The area may be crowded by fellow tourists but the image can still look fantastic even with people around. Set in a symmetrical Persian-style garden with lawns and waterways divided by wide paths, the mausoleum itself is flanked by two almost identical buildings: a mosque and an assembly hall. The queues may appear prohibitive but tourists are generally required to purchase a high-value pass which will enable you to jump a large portion of it. There is so much to see and do at this World Heritage site, from the sprawling gardens to the leaning minarets, the intricate calligraphy and floral motifs to the gem-studded interiors. Make sure to get there early and be prepared to spend a lot of time on your feet. 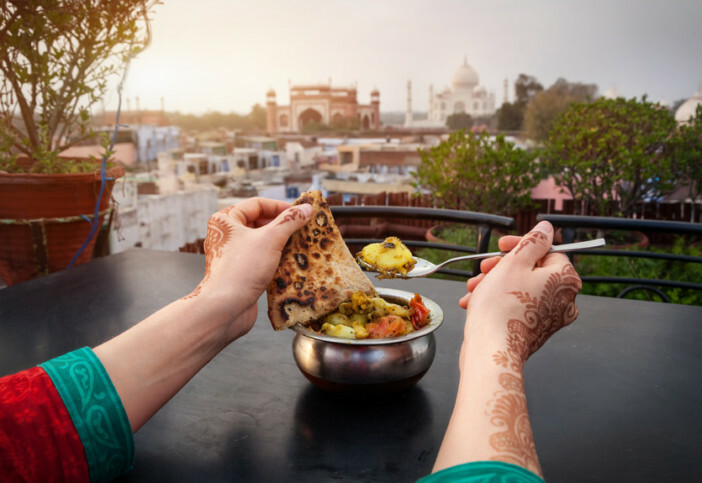 All that walking and picture taking is hungry work and by the time you’ve seen all there is to see, you’ll be ready for some of the delicious food that the city of Agra has to offer. If you’re planning to visit the Taj in time for sunrise, then Joney’s Place could be perfect for a hot breakfast. This diminutive restaurant cooks up cheese and tomato ‘jayfelles’ (toasted sandwiches) and banana lassis from what must be the smallest kitchen in Agra. Esphahan, considered by Lonely Planet to be ‘Agra’s finest restaurant’ has only two evening meal sittings at 6.30pm and 9.30pm so to be guaranteed a place, it’s advisable to book in advance. This exquisite menu is chock-full of unique delicacies and rarely-seen regional dishes. Try the bharwan aloo – a potato kebab stuffed with nuts, spices, mint and coriander or the mouthwatering safri gosht – braised lamb with pickled onions, dried tomatoes and spiced pickle. While there, you’ll be treated to the soothing sounds of a live santoor player. 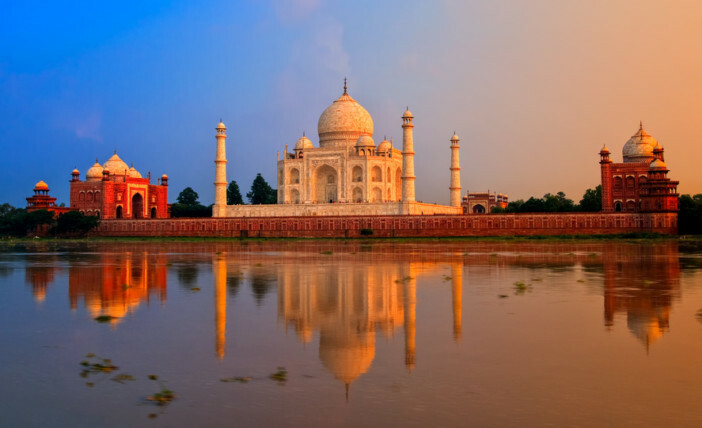 India’s most identifiable monument and one of the Seven Wonders of the World, the Taj Mahal looms fairytale-like from the banks of the Yamuna River over the city of Agra. You’re likely to encounter crowds, possibly touts and maybe even locals asking to have their picture taken with you but on top of it all you will experience a truly magical day that will stay with you for a lifetime.